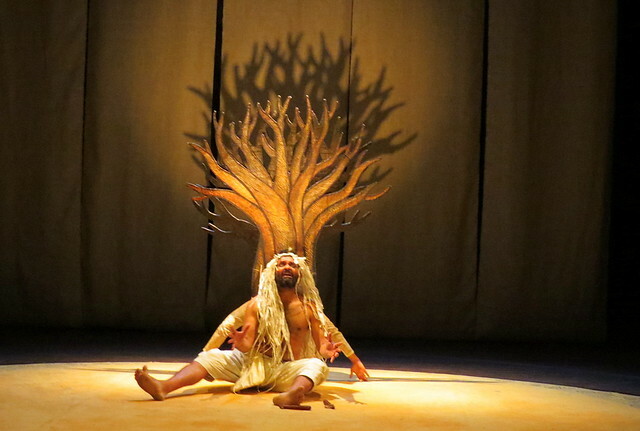 Once in a while, it’s a refreshing change to look forward to a children’s play, and on the 31st of March, ’18, I took my grandchildren to watch “Fish Tree Moon”, a play by Ranga Shankara as part of its “Aha!” initiative for children. 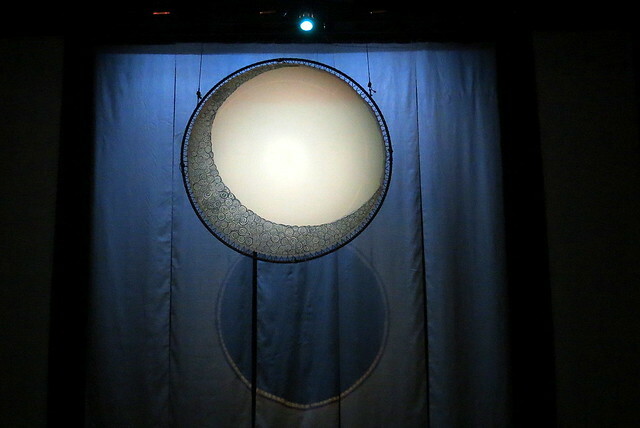 The beautiful moon from the play. The performances (3 in all) had been well timed for the start of the school summer vacations, and the play drew an almost full house, with many children eager to watch, and their families eager to immerse them in theatre. The play deals with a varied set of characters…. an old fish, a spirited girl, an eager boy, an ascetic and a bare tree . Each meets up with the others, and having heard that they can get their wishes fulfilled at Mount Kailash, journey there.The narrative was helped by the musicians, who also acted as sutradhars or narrators. The story of the journey, and what they find, around themselves and in themselves, when they arrived, formed the play. The visual and audio parts of the production were quite stunning. 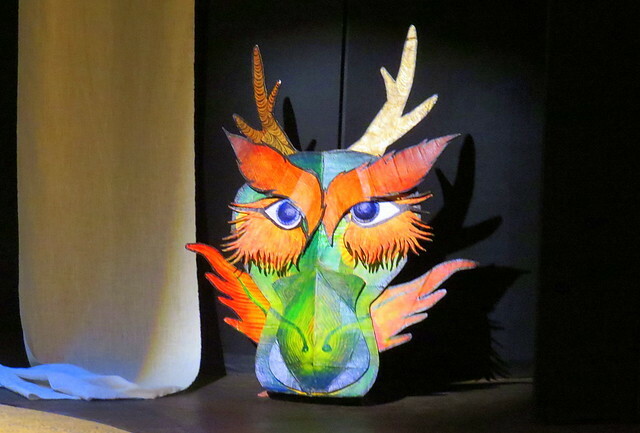 Whether the unusual white costumes of the cast, or the various papier maiche masks and other props used were extremely creative, and the set design was equally creative. 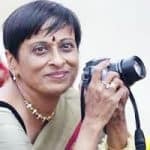 Sarees were turned into rivers, and long screens, unrolled from the top of the stage, actually made exit and entry points for the actors on an otherwise simple stage design. The use of shadow puppets, light-and-shadow effects, effective use of the stage space, and excellent choreography marked the production. 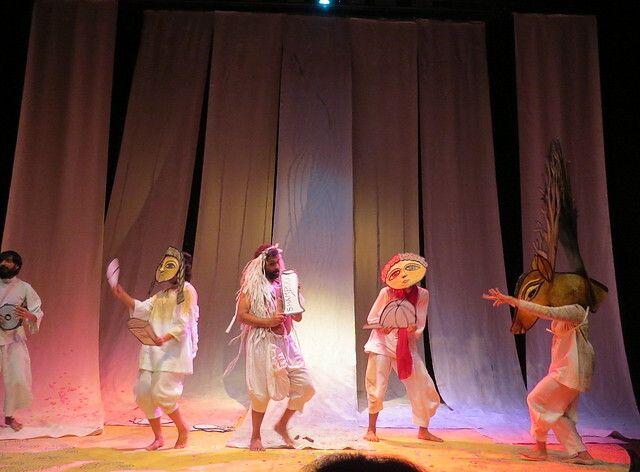 The masks, especially, deserve mention; they were superlative in both their creativity and the colour they brought to the performance. The tree that developed into the antlers of a deer, drew applause from the audience. The musician-singers might have sat at the side of the stage for the most part, but they were integral to the performance; introducing the audience to the action, singing of what was transpiring on stage, and sometimes dancing in unison with the cast, too. 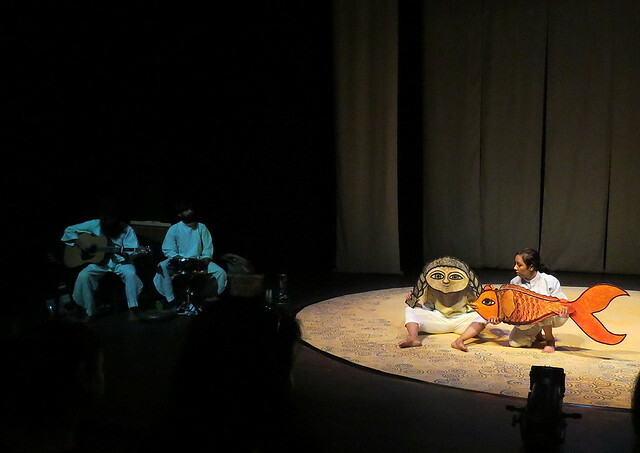 The huge flute carried by the ascetic might not have been used, but a wide variety of other instruments…guitar, xylophone, tambourines, drums, a kazoo…brought some vibrant music to those watching the play. The lighting design was also excellent. Parts were highlighted, different events explained and brought about, by a variety of light effects. The music was another attractive feature of the production. Whether the words were in English, Hindi or Kannada, the acoustics of Ranga Shankara made sure that they reached all parts of the audience. The action did play out in a fashion that the audience could follow, and there was a marked denouement so that the audience was satisfied that the end had been reached; there was a standing ovation when the cast took their bow. However, with all the audio-visual extravaganza, both the story and the direction seemed a little vague and loose. There was no clear narrative that the audience, especially, could follow, and since, sometimes, the words spoken by the cast were not clear, some guesswork was involved. But overall, the drift of the action was reasonably clear to everyone. But I do feel that a stronger narrative might have added to the lustre of the production. After the play, I asked several children their opinion of the play; after all, they, not the adults, were the target audience. “I liked the dragon the most of all,” said Kalyan (5). Taariq (6) said that his mother often brought him and his brother to see plays, all the way from Fraser Town; “I enjoy it ,” he smiled. Another suggestion I would make is that at the end of the show, the cast should introduce themselves, the director and the crew, to the audience When the audience has spent an hour watching a performance, certainly a few minutes spent in knowing who has built up the production and in what capacity, would be a good value-addition to the experience. A small brochure, simply designed, would also help in this regard, and give the audience some idea of how the performance has been staged. Many theatre groups have tear-off slips at the bottom of these brochures where theatregoers can give feedback and give their contact information. 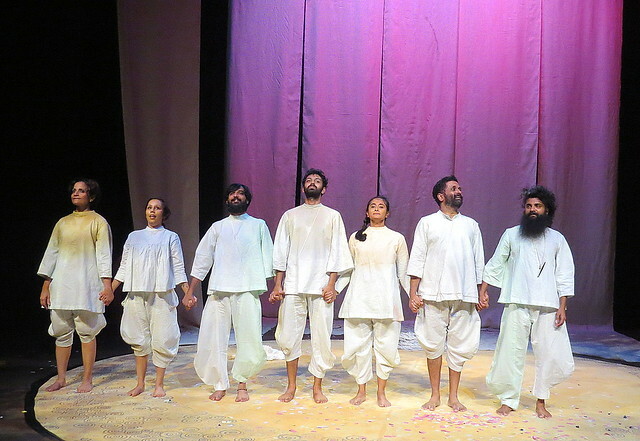 In all, a very pleasant production, which entertained the young audience at whom it was aimed, without too much of proselytization about current issues that often turn such entertainment into heavy moral lectures.